Aquatemp offers exquisite pool and spa water filtration products. Aquatemp offers exquisite pool and spa water filtration products. Filters compatible with this brand, along with many others, are available for our customers through the Filters Fast website. 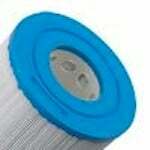 The Aquatemp 84-92287 R is a compatible replacement for the following pool and spa filters: Unicel C-7620 Aladdin 17537 The Aquatemp Pools 84-92287 Comp Pool Filter Cartridge has a diameter of 7 1/4 inches, and a length of 21 13/16 inches.